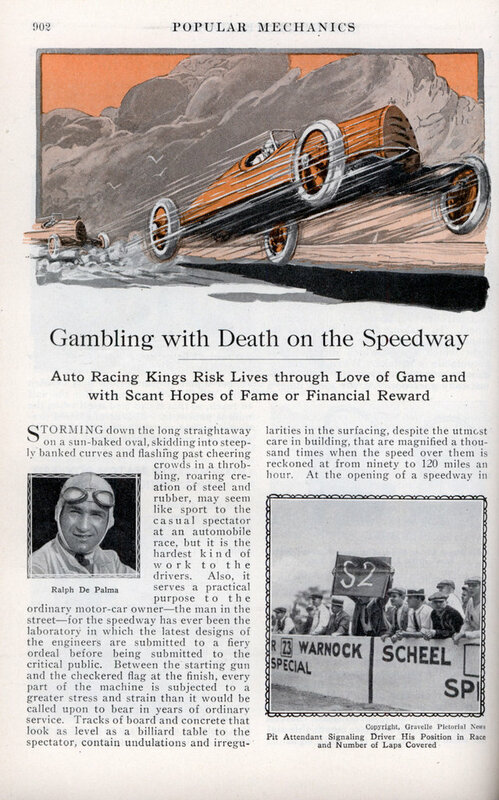 According to this article being a race car driver in the 1920’s was no walk in the park. It seems that many of the drivers on the race circuit would drive their actual race car from one event to the other and take off the fenders and head lights just before race time. I’m guessing life got a lot easier when people figured out you could just paint a giant Tide logo on your car and people would give you money. STORMING down the long straightaway on a sun-baked oval, skidding into steeply banked curves and flashing past cheering crowds in a throbbing, roaring creation of steel and rubber, may seem like sport to the casual spectator at an automobile race, but it is the hardest kind of work to the drivers. Also, it serves a practical purpose to the ordinary motor-car ownerâ€”the man in the streetâ€”for the speedway has ever been the laboratory in which the latest designs of the engineers are submitted to a fiery ordeal before being submitted to the critical public. Between the starting gun and the checkered flag at the finish, every part of the machine is subjected to a greater stress and strain than it would be called upon to bear in years of ordinary service. Tracks of board and concrete that look as level as a billiard table to the spectator, contain undulations and irregularities in the surfacing, despite the utmost care in building, that are magnified a thousand times when the speed over them is reckoned at from ninety to 120 miles an hour. At the opening of a speedway in the northwest, one of the drivers had to be lifted from his car at i the end of 200 miles, his body being covered with bruises. “Automobile racing is the hardest way I know to make a living,” declares Ralph De Palma. “Coal mining is mere child’s play compared with it.” Racing requires the strength to weather the rigors of the working day and night without adequate sleep or properly prepared meals for days at a time. It requires nerves of steel and the ability to take grueling punishment. Few drivers have ever jumped into a pilot’s seat and remained there. Most of them are graduates of the mechanics school like “Jimmy” Murphy, Harry Hartz, “Art” Klein and De Palma. A few have been able to outfit themselves, among them being “Tommy” Milton, Joe Boyer and Eddie Hearne. Racing is an expensive business as the cars cost from $5,000 to $50,000. One big factory recently estimated that it would cost $750,000 to build three racing cars and campaign them for a year. Strangely enough, however, it is not millionaires who play this game. 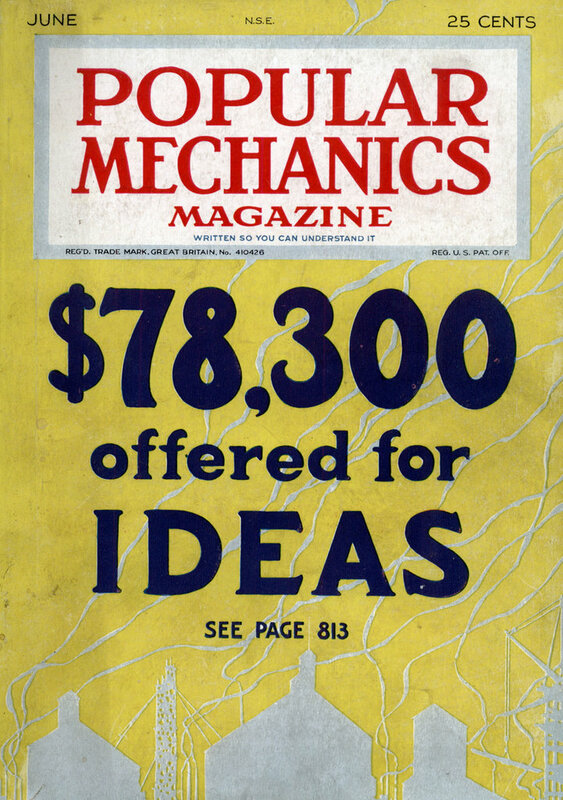 It usually is an inventor or engineer who wants to gain a reputation for his product or to quickly prove its merit. One Kansas City enthusiast spent $30,000 in equipping two stock cars with a special motor head for the Indianapolis race. Neither of them won a place. On the other hand, Sig. Haugdahl, after years spent in barnstorming on the dirt tracks, picked up a discarded airplane motor which had been built for the government. Fitting it into a chassis, he took the car to Daytona, and negotiated a mile at a speed of better than 180 miles an hour. Somewhat similar was the experience of a garage mechanic in a northern state. He rebuilt a small car himself, drove it overland to Denver and entered the Pikes Peak climb. Before the race, he did not even have money enough to equip his car with new tires, but finally succeeded in obtaining the much needed casings from a friendly dealer. In the contest, he defeated several specially built racing machines and some of the highest-priced cars in the country. Professionals who specialize in the dirt-track contests in all parts of the country are paid from $100 to $250 a week, while their mechanics receive $75 to $100. This is in addition to their railway fare, and they pay their own living expenses. These cars travel in groups, or “stables,” and enter contests at county fairs, often contending against local drivers. Some of the professionals, however, have their own cars and travel from one town to another in them, stripping off the fenders and headlights just before entering a race. One of the most successful of these is a former locomotive engineer. After winning his first race in a stripped stock car, he abandoned his railway job and devoted his entire time in the summer months to racing. Another is a former garage mechanic who has gained fame throughout Kansas and the central states. Besides brute strength, racing requires quick thinking, as the wink of an eye often means the difference between life or death and success or failure. One instance of this took place during a climb to the “top-o’-the-world” at Denver. Several factory teams were entered. Practice over the twisting course up the Peak was permitted only in the morning hours. From the bottom, the finish could not be seen, so it was impossible for team managers to check the time of the rival drivers. One of them, however, located a vantage point from which he could view both ends of the course through a pair of binoculars. He found that his car was several seconds slower than several of the other entrants. He also noticed that all of the cars slowed up slightly in taking the worst curve on the climb. In doing this, the clutch was withdrawn and the throttle slightly closed to prevent racing of the engine. After going over the course carefully himself, he ordered his driver to slip his clutch, but not to touch the throttle. This allowed the engine to race, but when the clutch was thrown back again, the car picked up speed more quickly, although the spinning of the rear wheels wore out a pair of tires every time the car made the ascent. The result was that the slower car won the race.